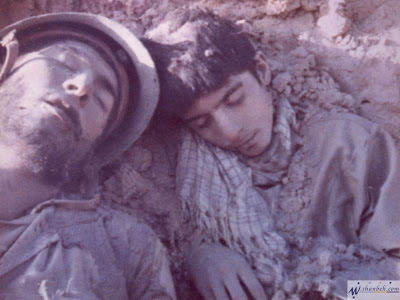 The official statistics of Iranian Government shows 213,255 Iranian people have been killed during the imposed war against Iraq from 22 September 1980 to 20 August 1988 (including 2,906 children and 32,275 students). During the war, Iraq was regarded by the West (and specifically the United States) as a counterbalance to post-revolutionary Iran. Soviet Union (Currently known as Russia), USA, UK, Israel, France, Italy, Singapore, Saudi Arabia, Egypt, Kuwait and Jordan supported Iraqi government to kill more than 213,000 Iranians including 72,629 people under 19. They have supported Iraq's government to use chemical weapons (such as mustard gas) against Iranian troops. More than 335,000 Iranians suffered from disabilities as a result of the war and most of 40,000 Iranian prisoners of war have been killed and never return to their country. The war cost $1,000,000,000,000 USD for Iran. Yes! One thousands billion dollars! There are still 24,000 square kilometre lands in Iran which contaminated with land mine! The area is bigger than 90 countries around the world, including Israel! Now you tell me, what you expect from UN, western or Arab countries about Gaza Massacre, with about 900 victims during the last 16 days? Ha?